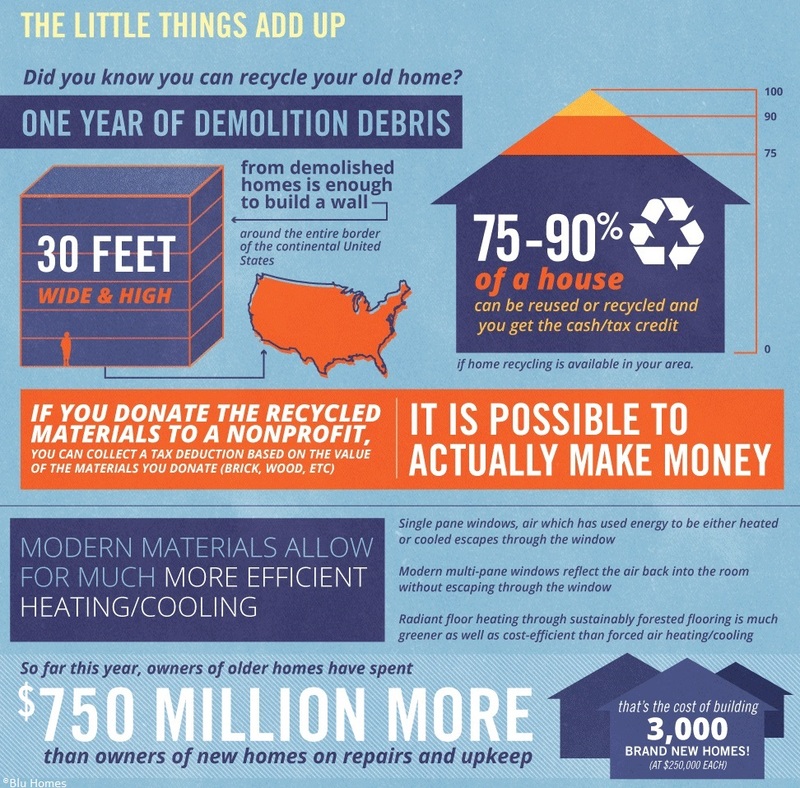 Each year, homeowners, business owners and property owners make the decision to demolish while often overlooking a more eco-friendly and sometimes more cost-efficient method of removal—deconstruction. Deconstruction is considered "unbuilding." It involves taking a building apart piece by piece, essentially reversing the order of its construction. The second method most commonly used is whole-house deconstruction. This method is similar to soft-stripping in many ways, but it goes a step further by taking apart the entire structure for salvage purposes. These materials are saved from the landfill and salvaged. Sure, simply demolishing an existing building or structure may seem like the quickest and easiest route to take, but the truth is that a lot of the building materials used in these demolition jobs end up in landfills, which are potentially toxic to our, and our environment's, health. In 2003, the US Environmental Protection Agency estimated that over 164 million tons of waste generated from construction, renovation, and demolition projects ended up in landfills. And that number isn't getting any smaller. According to Brad Guy, President of the Building Materials Reuse Association, demolition alone accounts for almost 60 percent of the nation's total waste stream. By choosing deconstruction over demolition, not only are you saving these materials from clogging up landfills, but you are also reducing the amount of carbon dioxide produced when new materials are made. Where do the reclaimed materials end up? Any materials that are saved in the deconstruction process are donated to non-profit organizations that either resell them or use them for future projects in the community. These are considered charitable donations and are eligible for tax deductions, claimed by either the homeowner or the contractor. While salvaged elements may not be able to be donated for a tax write-off, they can certainly be utilized back into future projects. What should I consider before making my decision? The process of deconstruction is a much more intricate process than your standard demolition job. Therefore, it can add anywhere from several days to several weeks to your job. Deconstruction uses more manual labor than machinery, which means that worker safety considerations and costs can be somewhat higher. This can also have an effect on how long your job may take to complete. Since you are dealing with more materials by hand, hazardous material regulation and management can be more difficult for deconstruction than it is with demolition. Proper safety gear is a necessity. Depending on your specific job, deconstruction could cost significantly more than demolition. However, the tax deductions can add up, saving you money. Weigh the pros and cons, and make the call. Now that you know the difference between deconstruction and demolition, you can make the right choice for you and your project. Helpful Hint: Hometown can help you find a local dumpster rental company for the unwanted debris, too! Read up on how to get the best price and when a large dumpster is the best option. What does house demolition cost?